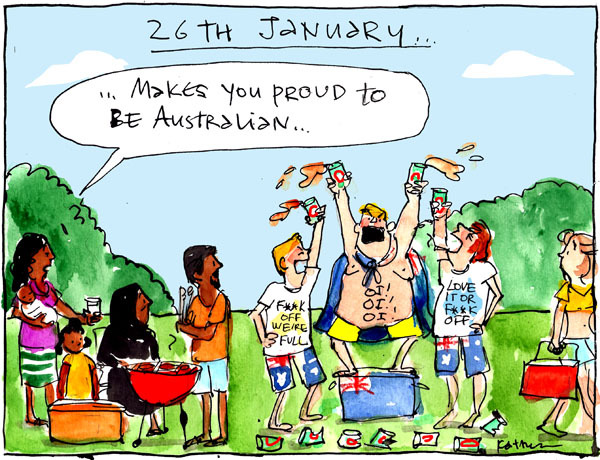 Fiona Katauskas' work has also appeared in New Matilda, ABC's The Drum, The Sydney Morning Herald, The Age, The Australian, The Financial Review and Scribe's Best Australian political cartoon anthologies. Very good Fiona. The only things they "love" about it are the booze, the loud blokie showing off, and anything resembling sheilas. Oi oi oi? Not in your life. And I'm an Australian. No, not an Aussie. An Australian.